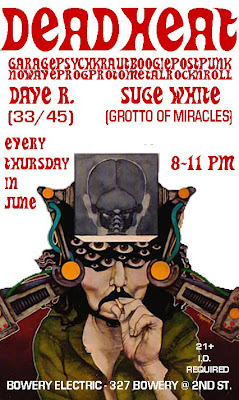 DEADHEAT: A 33/45 - Grotto of Miracles production at BOWERY ELECTRIC - 327 Bowery @ 2nd St. from 8-11 the first Thursday of every month. A garage nugget, 70s heavy boogie, art-punk krautrock free for all to wake up the third mind for some post-happy hour pre-late nite revelry. Check the mix for one corner of the musical map ... then stop by for booze + rocknroll jams.